May 23rd - 26th, 2013 at the Houston TX at the George R. Brown Convention Center. The Cylon Empire and the one and only Mr. Andrew Probert (the designer of the iconic classic Cylon Centurion) gave a detailed talk on what goes into creating a high quality, screen accurate set of Cylon armor. Many thanks to Blackstar Squadron for helping make the panel possible. There are those who believe...that life here began out there… From the beginning, the Internet has allowed Battlestar Galactica Fans to create online communities that provide online resources most offline communities typically could not. Our three presenters spearheaded the creation of online resources for fans by sharing their passion through their websites and social media. All three panelists are experts in collecting screen used props and costumes from BSG and are authors of some of the top BSG related websites on the net. They also inadvertently set the precedent of preserving the legacy created by BSG through digital media. Come find out what drives their insane quest for information and learn some of their secrets of collecting BSG as they discuss the forensic science involved with providing accurate info to fans and collectors of screen used props and costumes through their Ragtag fleet of BSG websites. Dale has been a fan of Battlestar Galactica since the original 1978 series. Dale sent correspondence to the production staff at Universal Studios who worked on Battlestar Galactica while the original series was still airing. Through those letter exchanges, he gained incredible insight about the original Battlestar Galactica and the Cylon costumes. Since that time Dale always wanted a Cylon from BSG, and after he was able to purchase one almost 10 years ago he decided it was time to share his wealth of knowledge. 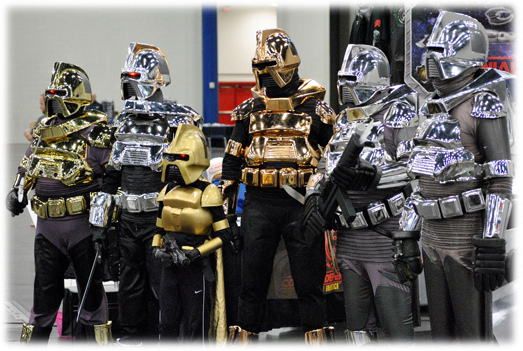 With the intent of helping others achieve their personal goal of having a screen accurate Cylon costume Dale started By Your Command to provide true information on how to build a screen accurate Cylon costume. Dale’s website has become one of the top digital resources to find anything Cylon related. With over 2000 topics posted in the builder’s forum, and gallery with over 20,000 photos posted. Panel text copied from Galaticon III website..